The first time I ever made money on my own, outside of a job, it was the coolest thing ever. It opened my mind to the possibilities. What I had to offer was valuable enough that someone felt compelled to open up their wallet or write a check. But shortly after, I started to feel discouraged. I'd made some money, but not a ton. After doing some basic math, I realized I'd need a similar transaction to happen dozens, if not hundreds, more times in a year to sustain myself and pay my bills. Maybe it wasn't possible after all. But I'd made a faulty assumption: that all of my revenue would come from a single source. Maybe you've made the same assumption. You've worked with a few clients, made and even sold a few products, and you're wondering how to go from a couple of sales and closed deals here and there to something that's actually sustainable. You do the math and conclude the number of transactions you need is unrealistically high. Now you're discouraged. The key to sustaining yourself as a freelancer, small business owner, or entrepreneur is diversified sources of income. As you go, you want to put effort into creating systems that continue to serve you. That's not to say you can't ever leverage your time, but as much as possible, you want to build assets that keep generating revenue. Over time, you will build up multiple flows of income. Virtually every entrepreneur you know who is making a living for themselves (and then some) has diversified sources of income—not just one. Now, many people understand this (either inherently or by having learned it), but most people make the mistake of trying to build up these multiple flows at the same time. Instead, you want to build up systematically, create one flow, ensure it's sustainable, and then move on to the next one. These are three ways you can make money from anything you do. Each of them breaks down into a multitude of different revenue-producing assets. For instance, within client work, you could perform services yourself, run an agency, or even subcontract out work. Products could be anything—digital or physical. Teaching could be writing a book, leading a workshop, or producing an online course. Once you understand that you don't have to rely only on repeating the one thing you've done to make money, you'll feel relieved of all that pressure. There is so much you can monetize around your passion, but if you try to do things out of order, you can end up burning yourself out or killing the passion. That's why I wrote Overlap. I wanted to simplify the process for you to reduce overwhelm. No more guesswork, no more stress and anxiety. It's possible to make a living doing what you love (no matter what it is), and I laid out all of the steps for you inside Overlap. 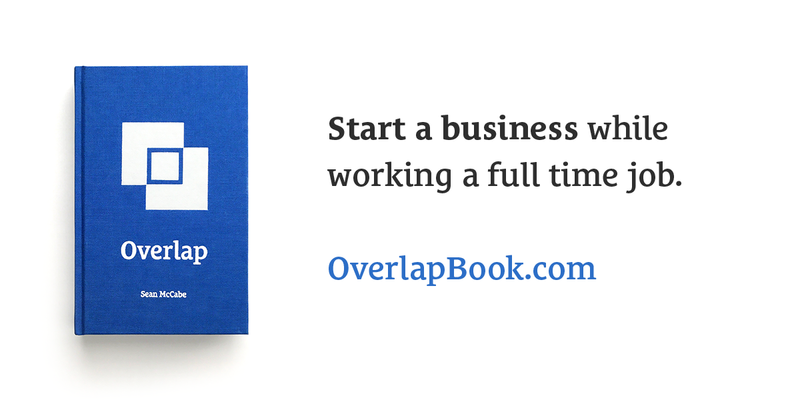 If you're ready for a step-by-step guide to getting unstuck and creating financial freedom for yourself, check out Overlap.